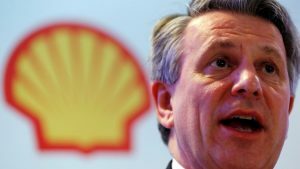 In its first review of its association with 19 key industry groups, Shell said it had found “material misalignment” over climate policy with the American Fuel & Petrochemical Manufacturers, and would quit the body in 2020. Mindy Lubber is the CEO of the corporate sustainability organization, Ceres. Lubber spoke with The World’s Marco Werman about Shell’s announcement. If this is about the goals of the Paris agreement, it seems Shell’s going to have to change a lot more than who does its bidding in Washington. How does this move fit into Shell’s broader strategy to change what they do and how they do it? Well, that’s precisely what needs to happen. The fossil fuel industry is going to have to look substantially different. And so what the investors were saying to Shell, in many, many of our discussions and meetings, is you need to look at the future of this company, you need to set goals for — I would argue — radically reducing your emissions, and that might be starting to change your product mix. It may be that some of these oil and gas companies need to develop more of a renewables part of their business. It is the energy mix of the future and if they’re going to stay viable, they need to be moving in that direction. And what investors are asking them is to set very clear goals and implement them on how they’re going to bring their carbon footprint down over the short term and over a longer term. … There’s no question, Shell’s got a lot more to do. They are at the start of their process, not the end of it. We all know that to get to the Paris Agreement, it’s about changing everything in what you do. Shell has to look at what the company might be and might look at 10 years from now and 20 years from now. That’s more than a fossil fuel company. You know, there were certainly two or three other fossil fuel companies that are either following their lead or making their own commitments. A couple of them are probably in Europe, Total, BP is certainly trying to do more, but we’ve got ExxonMobil, who’s doing anything but, so we still got a long way to go. I think it’s important more than symbolically that Shell is setting goals. They are holding their executives accountable to meeting those goals. They are being transparent about it and they’re starting to pull out of lobbying organizations that, frankly, lobby for policies that will defy their goals. That’s a good start. And we need to see the other fossil fuels follow suit.